The Priory is a grand, old Dame and I love her dearly. But will she be rushed? She will not; she will put on a show in her own good time – thank you very much. Despite my whines that everybody else’s gardening blog was awash with pretty flower pictures, she blithely ignored me and pulled on yet another layer of green. And then another layer (after all it gets cold down in this valley), with nary a flower in sight. It is only in the past couple of weeks, that she has, at long last, languidly fluttered her verdant petticoats and given us a glimpse of her summer charms. And so now (suddenly) there are flowers at the Priory (phew); here are some of them. 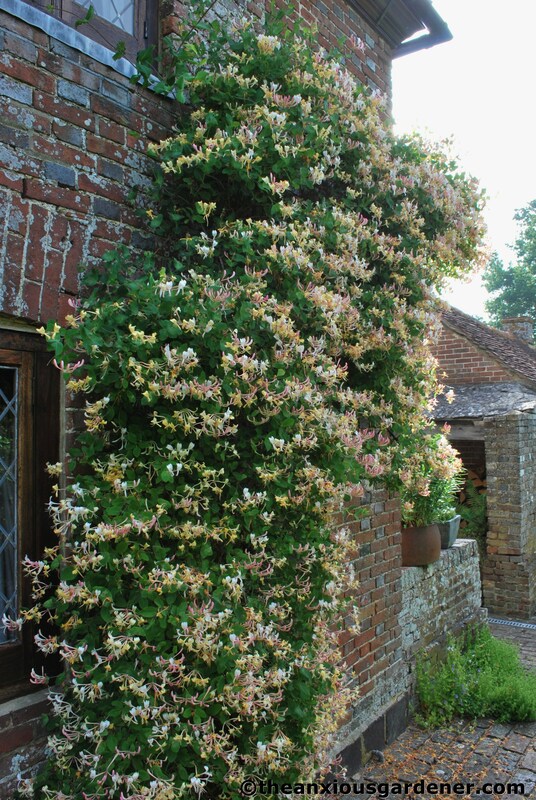 The south wall of the house has a dependable honeysuckle – covered in blooms and delicious to sniff. And sniff again. It requires little attention; just a light clip after flowering. The scent is best experienced very early in the morning (or in the evening) – so if you get the chance, fill your lungs. 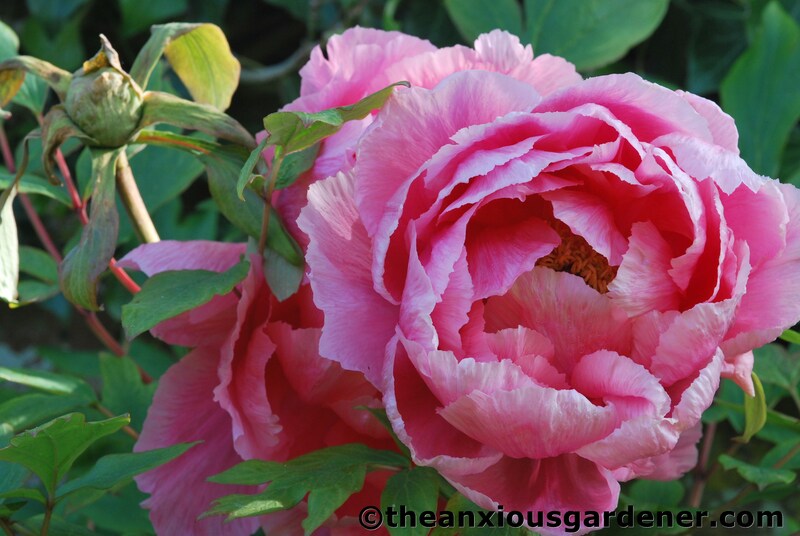 The one surviving tree peony flowered a week or so ago. Two out of the three original little trees died last year. They were old and had been strimmed (yep, true) in their poor blighted lives, so I’m quite surprised that they survived as long as they did. This one has a big blousy flower which is always welcome. But they last such a very short time (three or four days) that I shan’t be so very sad if this one gives up the ghost too. … of which there are several; including this one up against the house (pre-dates my time so no name, I’m afraid). 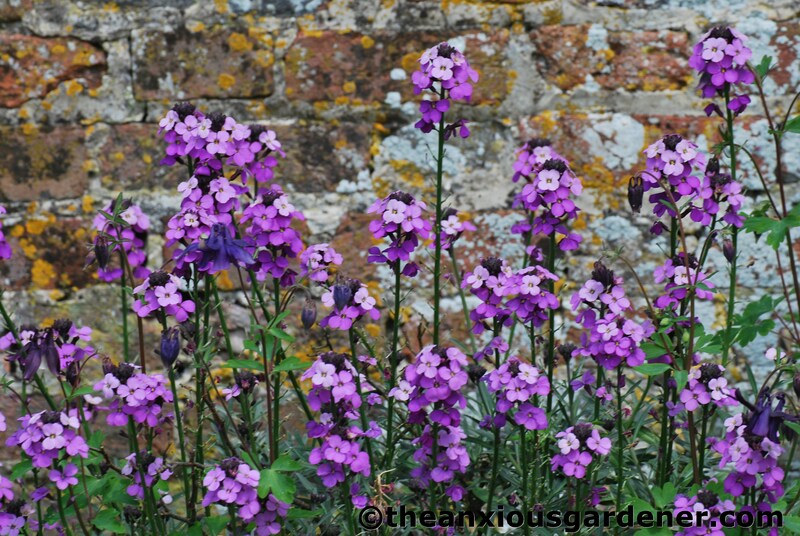 Erysimum ‘Bowles Mauve’ is a fine stalwart, flowering all summer long though not always surviving the winter. Luckily, cuttings take easily. Isn’t the lichen covered wall lovely? Least I think so. 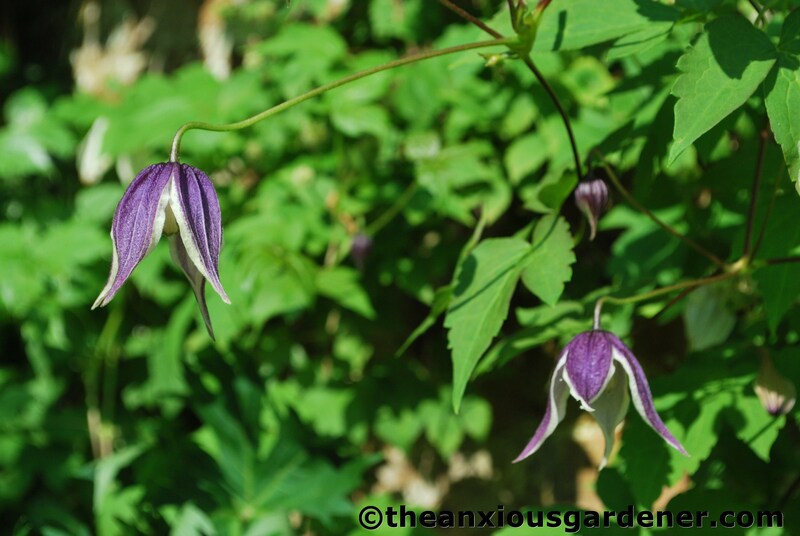 … Clematis koreana ‘Blue Eclipse’. Perfect, delicate flowers that stutter on through to July after its first flush of flower in April/May. 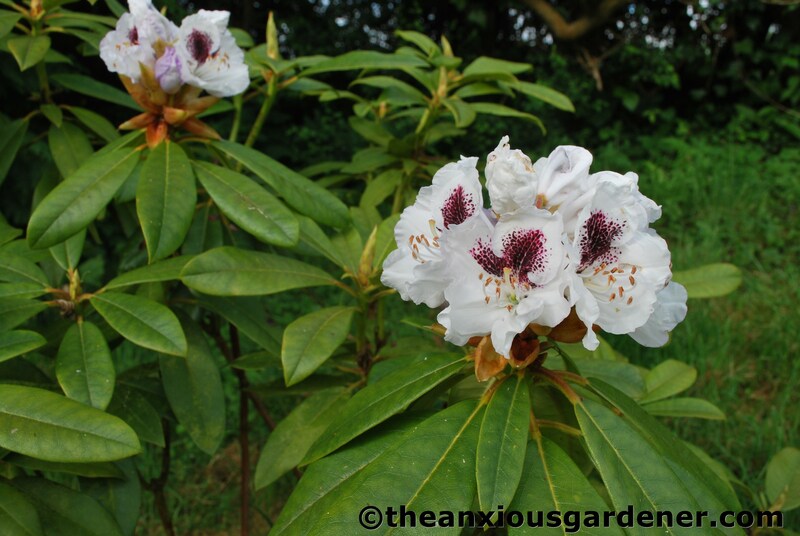 Because there was already a large bank of rhododendrons, I swallowed a bitter, lifelong aversion to the things and planted four more of them. 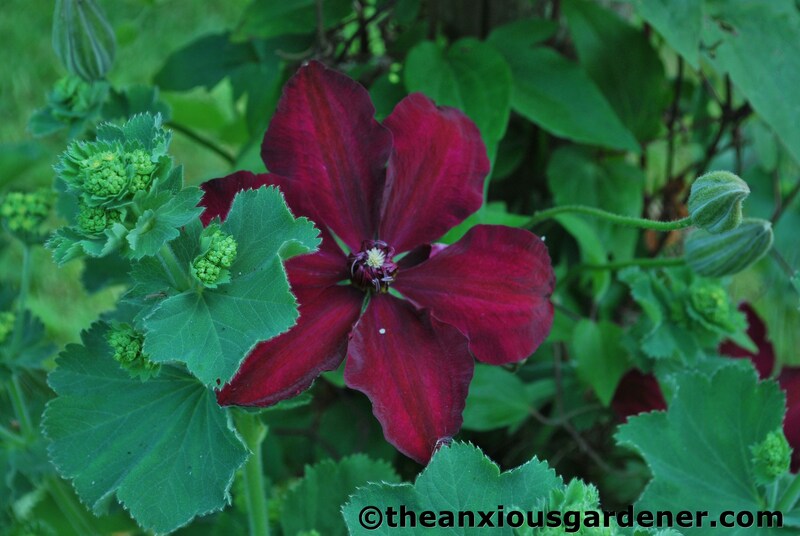 I’ve become a bit of a convert (as I have with so many plants which I used to dislike) and particularly wanted (and hunted down) the above: R. ‘Sappho’. 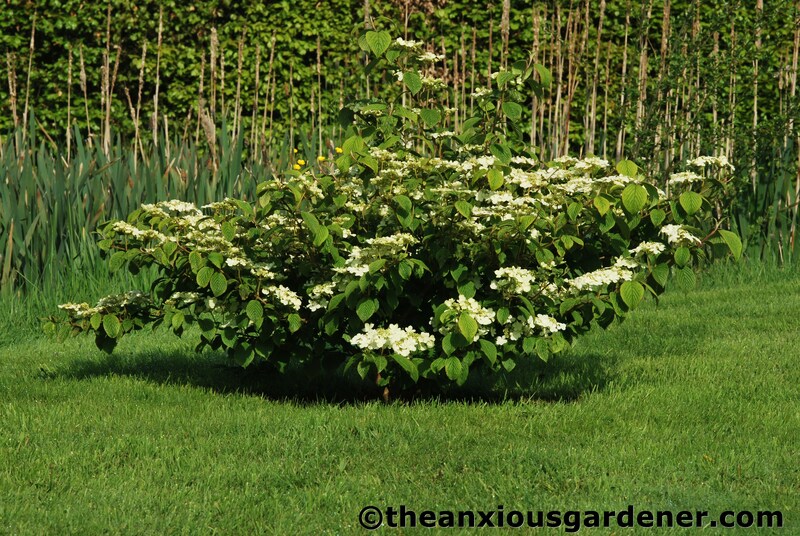 … Viburnum plicatum ‘Mariesii’. Three years ago, I put in a small plant on the west lawn by the pond. 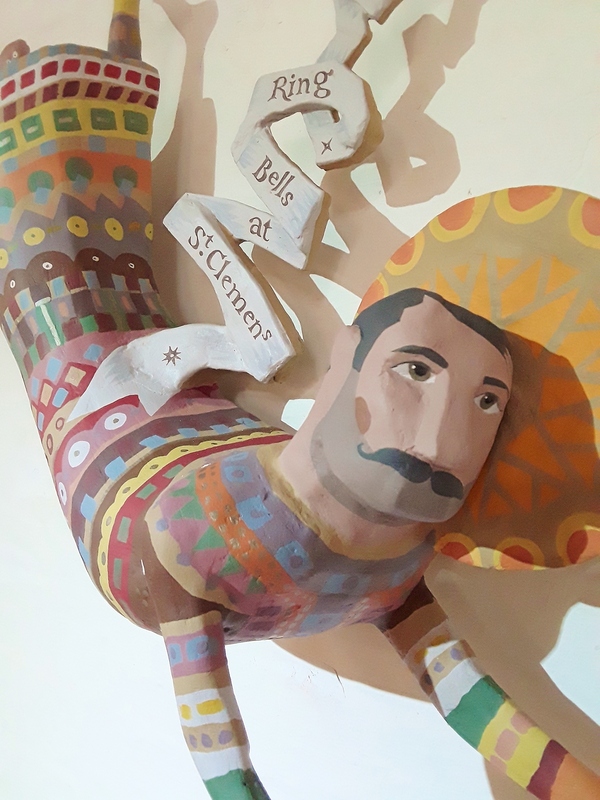 It has tripled in size and eventually, its many tiered form will be four metres across and ten feet high (bit of a metric and imperial mix there for you – I like to be even-handed). Can’t wait – at maturity they are a stunning spectacle. Alliums and nepeta dominate the long borders. Gosh, isn’t it blue? Though that will change as the season progresses. Really it will. … heuchera in-fill. (A young Kerria japonica is to the left). The box hedge is new-ish and hasn’t yet been tightly clipped. 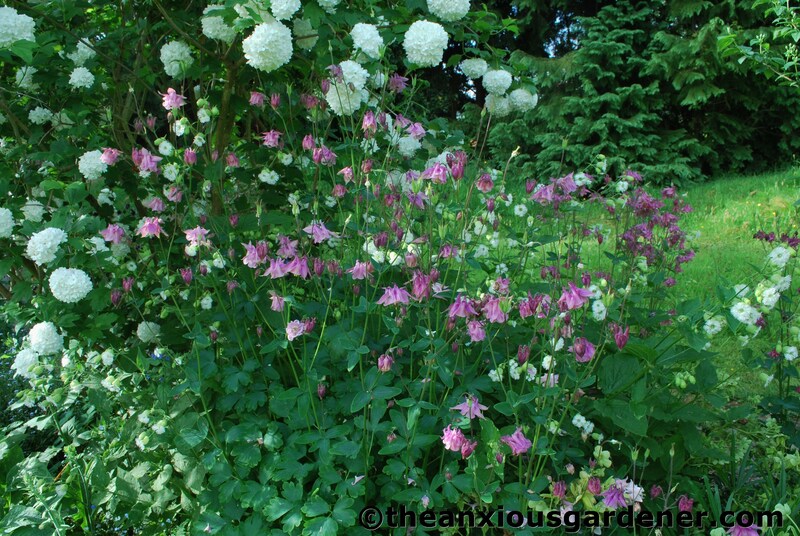 … aquilegias and silene all a-jumble. Foxgloves will join the mix soon. 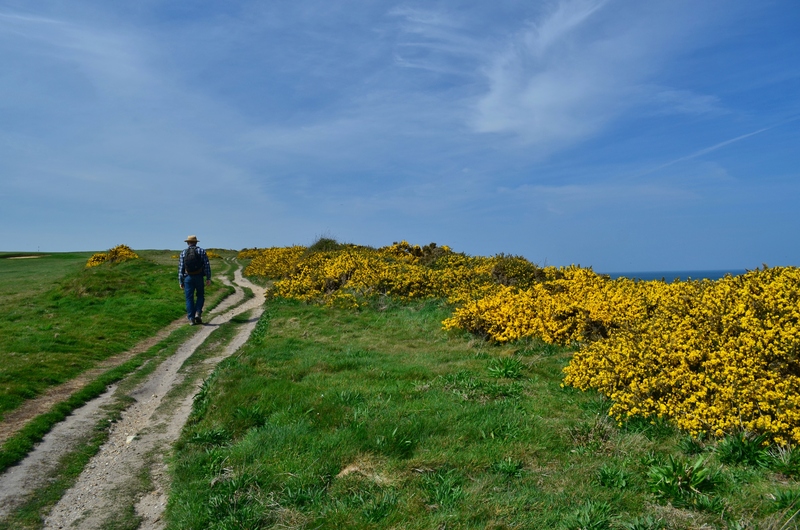 … planted here, where the soil is moist all summer (and boggy in winter). They seem content. … he does dominate the garden. For which reason, I am so very grateful to the unknown person/persons who had the foresight to plant him. In 2010, I planted a fifty foot double line of beech saplings (thirty odd plants) in front of the gate on the west lawn. I’ve lost two of them so far but thankfully have a small stock of replacements to hand. 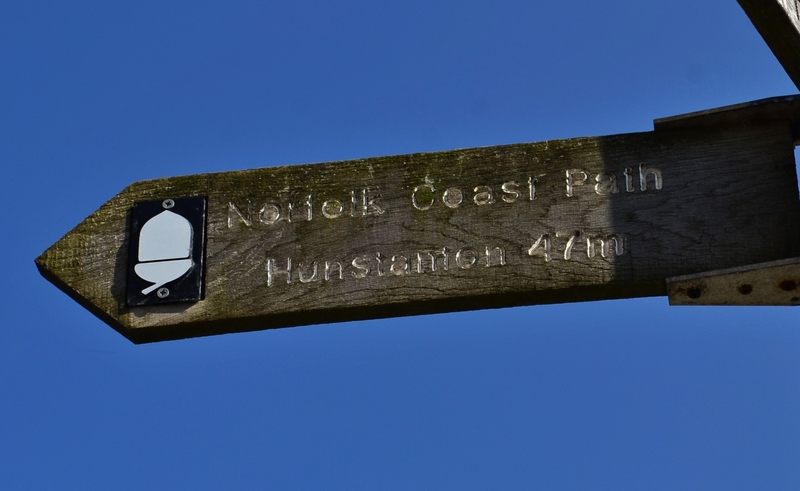 In time, they will shield the house from prying eyes out on the public footpath. Out on the meadow, the 200 Camassia quamash – which I planted in autumn 2010 – have flowered. Last year there were perhaps a dozen blooms but this year they have begun to make more of an impact in various small patches. But there is always something in the garden to bring you back to earth with an uncomfortable bump. 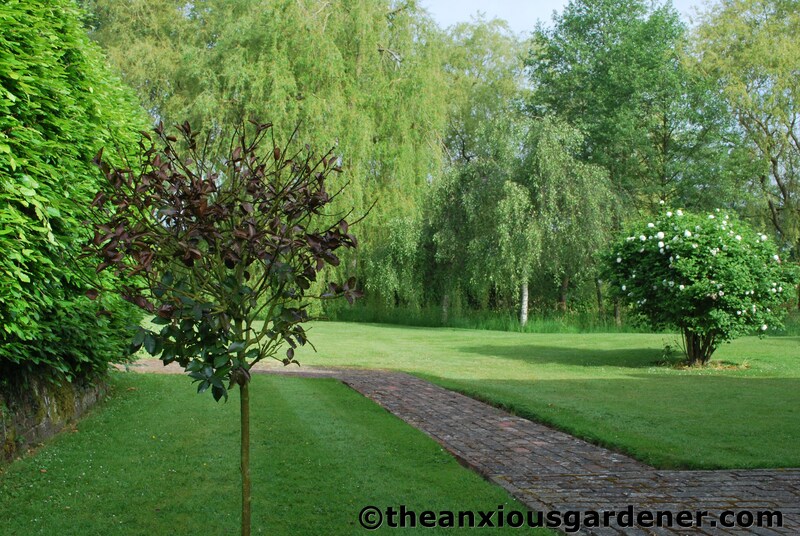 One of a pair of standard hollies I planted by the house (with another V. roseum in the background). One is hale and hearty and this one? Well, it’s not. Gardening, eh? So very fulfilling and then the Gardening Gods turn around and slap you across the face. Just to remind you who’s boss. I’d like to hear what you think. 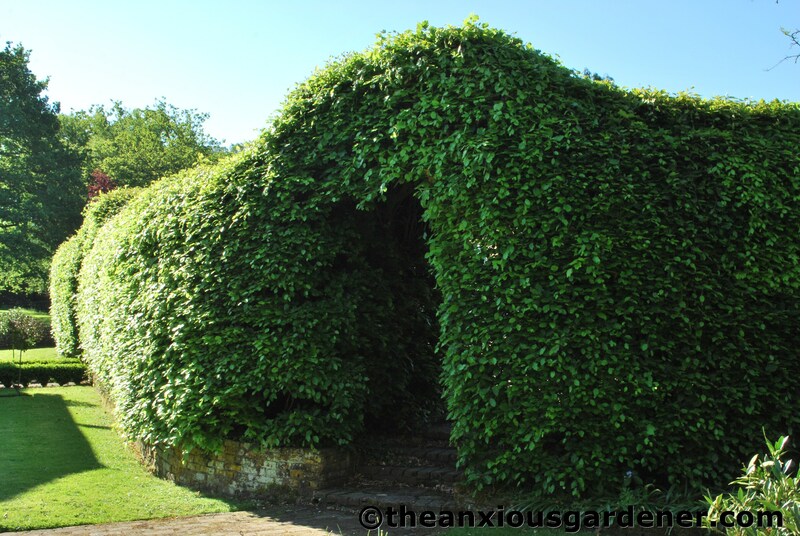 Not about the shakiness of the camera or the lamentable (lack of) script but whether the gardens are how you imagined them; especially those of you who may have read about the Priory for a while. Is it how you imagined? Bigger, smaller? (Not that the clip shows all the grounds, by any means). I make no secret of how I feel about the place but, as it gets so very few visitors, it would be interesting to get your views. Your blog is a real find. I am impressed with the video too. I am not sure my tech skills are up to it but I might give it a try. My garden too takes a long while to warm up. I blame height and northerliness, well a bit of both. This is a good thing because it provides me with the perfect excuse/reason for overdosing on bulbs. Fabulous! A garden is always worth waiting for. 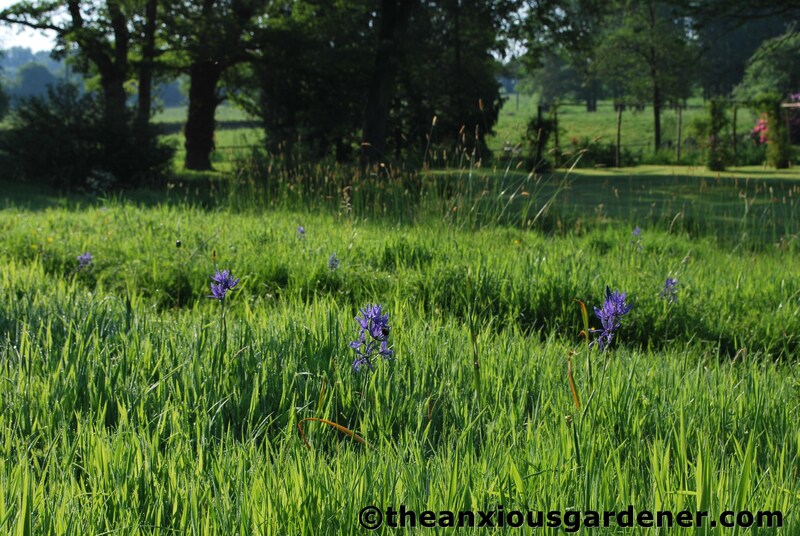 The camassias in the grass are lovely – I no longer have a lawn and don’t miss it one bit – and then I see a photo like this. Too scared to watch vid’ in case it’s a Video Nasty…I know what you’re like! Thanks for the video. The Priory is much larger than I imagined, especially with the herbaceous borders and veg garden tantalisingly off in the distance. 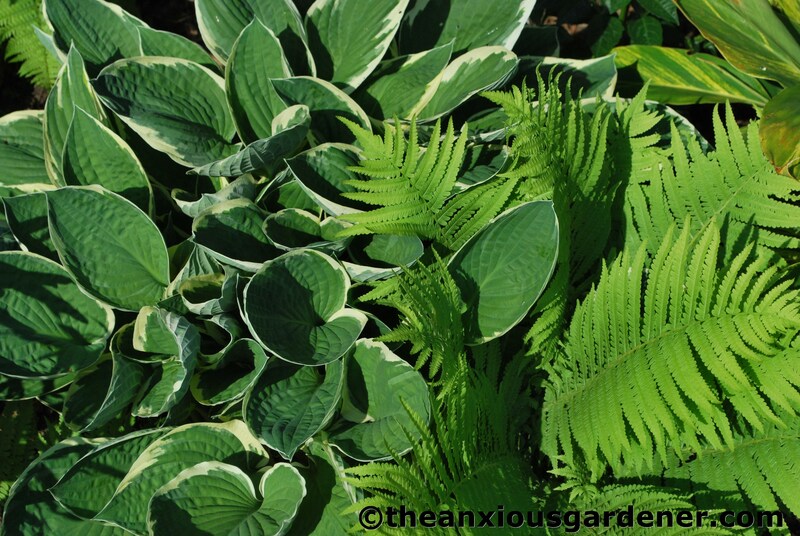 It all looks gorgeous and your hostas are amazing. I can only grow them in pots and even then they occasionally suffer damage. 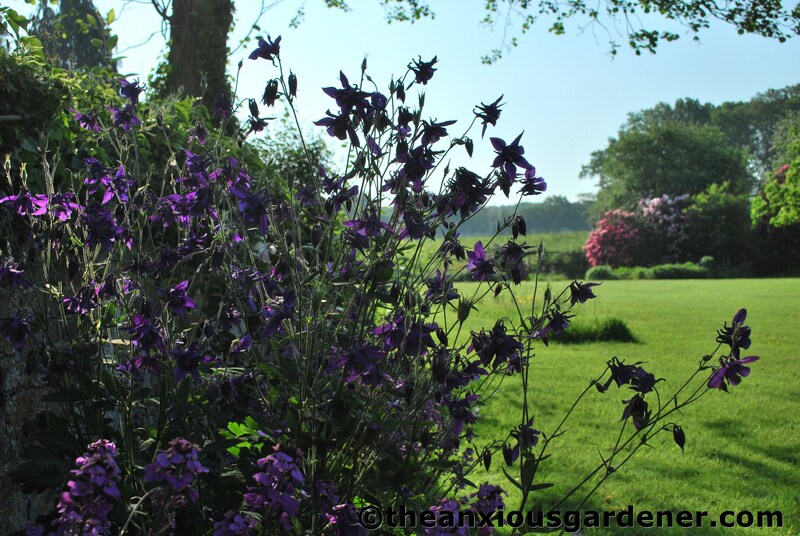 I love the shaggy beech hedges and the camassias. Is the Priory ever open to the public? 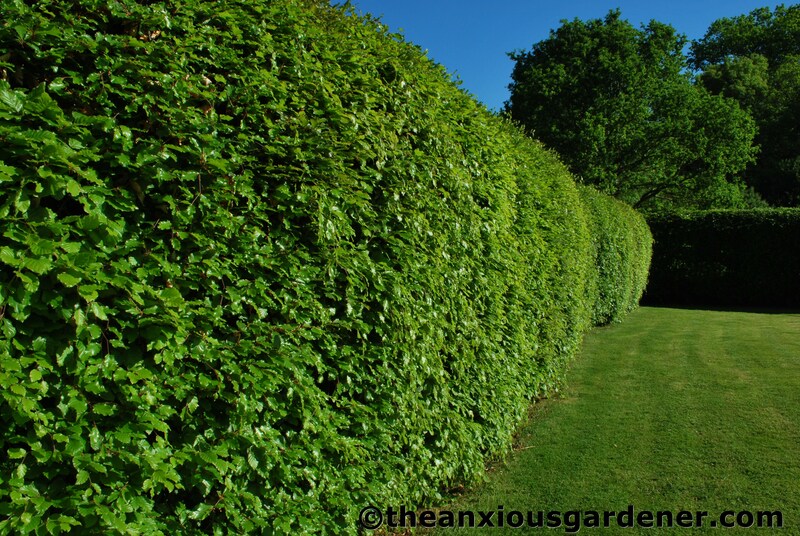 I think I would feel overwhelmed by so much to do and all that mowing and trimming hedges, certainly my least favourite jobs. 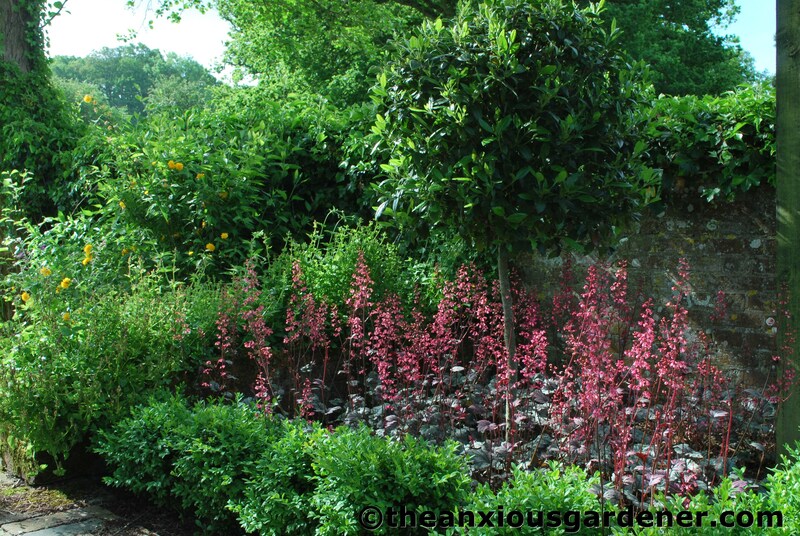 I sympathise that so much time is spent doing them when you want to do the good stuff like planting and propagating. My own pond is tiny but appears to be doing a very good impression of pea soup at the moment. Not enough oxygenators maybe, I’m not sure. Ah, alas I have no sound on this machine, and strict instructions not to hog our slender rural bandwidth at the minute, so will have to revisit this post to watch your video another time! Pleased that you have flowers everywhere though, and they definitely look worth the wait. Love the honeysuckle particularly – and that shaggy green beast. Great hedge. Such a lovely garden ! It’s a beautifull piece of nature and I think you have a lot of wildlife there. The butterflies will love your nettles. 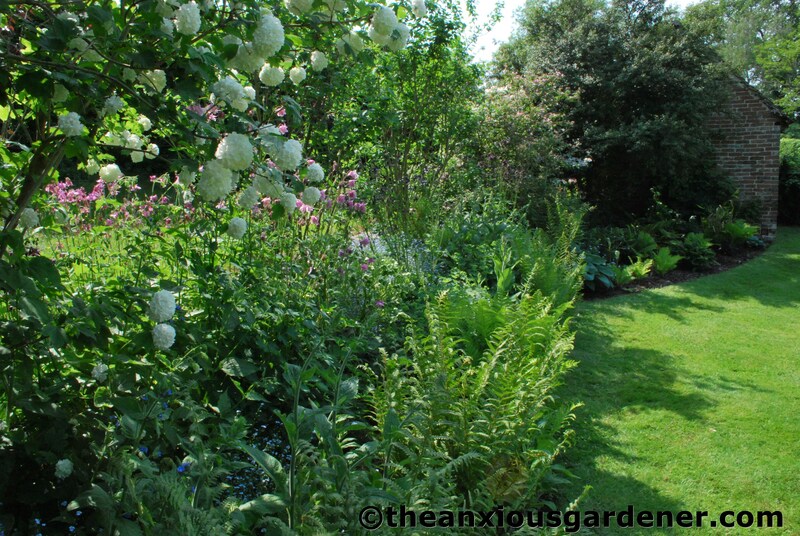 It’s a beautifull piece of nature, a garden shouldn’t be too manicured, especially if you care about wildlife. The butterflies will be gratefull to you for the nettles ! Well, they say that Beau Brummell took several hours to get ready for the day, but when he finally left his dressing room he looked perfect. The Priory seems to have taken a page from his book this year. Your description of the beech hedge as a lumbering, shaggy beast is spot on — it really looks quite lovable, even to someone who in the past has not always been fond of hedges. The only real surprise in the video, I thought, was the location of the rose tunnel. For some reason I pictured it being much farther away, like, miles and miles away. The way you end the video, with the good tree for sitting under with a mug of tea, sums up the overall “feel” I’ve always had of the garden as a park-like one, where the point isn’t to be funneled endlessly along narrow pathways toward particular focal points but to be able to drift around at will and enjoy being in nature, while having more comfortable grass to sit on and the occasional lovely flower bed to admire. And sheep, off in the middle distance. Perhaps this isn’t what you were looking for, but it’s as cold as winter in New England today, rainy and miserable. And I just got to visit your sunny Priory Gardens and listen to you and the birds…thanks so much for posting this, it was like a happy vacation for me! 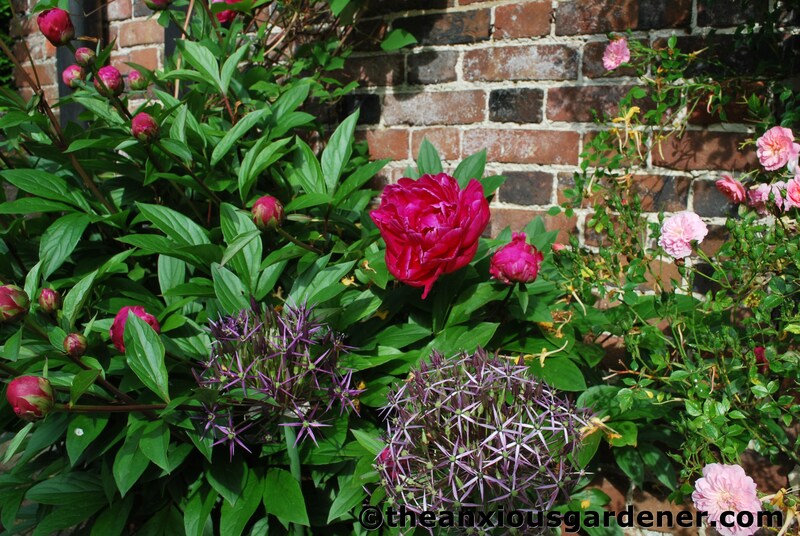 The garden is looking fab right now…a credit to your hard work. I suppose I would say “yes, it is how I pictured it in my mind’s eye.” Love the video, nice to hear your voice. Makes me feel I know you a little better. Dear Dave, the Priory is looking stunning! So relaxing, so countryside Lord house, yet elegant. 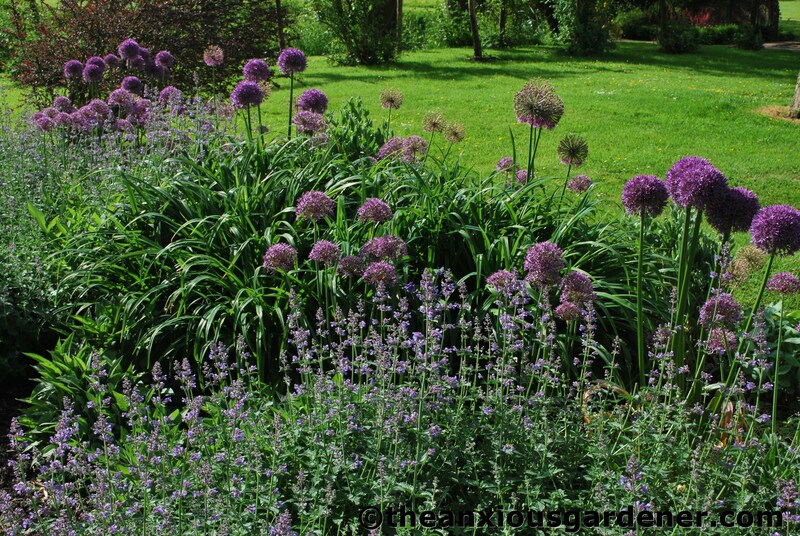 The large bed with catmint and alliums looks amazing and the Eve bed is very nice too! I remember a path passing nearby from a previous post, those heucheras have really grown! 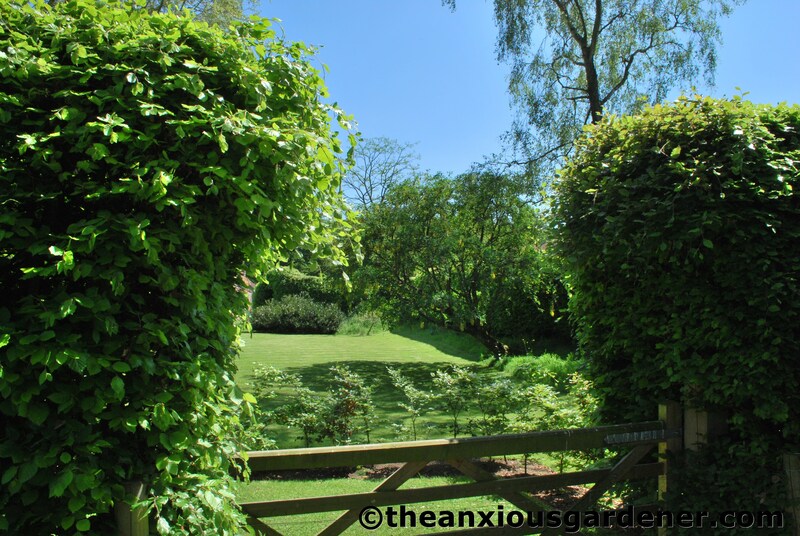 (And I like the little unclipped box hedge!). Thanks for the video because now I know what I just pulled out of the pond. It was duck weed. Lucky for me the pond is only 4m in diameter and I managed to get quite of lot of the duckweed out in one go. Was wary though of pulling out any more Elodea pond weed because I had pulled loads out about two months ago and think that was maybe why the duckweed got a hold. I have never seen duckweed in our pond before either and we have been here nearly five years. I think it is probably got a hold due to the freak weather conditions ie Loads of sun back in March, then loads of rain, the a week of solid sunshine…… like a sort of algae bloom thingy. If nothing else, the video brings to life the scale of the duckweed problem….you have my sympathy. Has no one ever found a solution to this? I had hoped your floods would have washed it out (as they have mine). Maybe try some primula florindae on the island? Once established, you would never need to bother with them – and being submerged is all in the day’s work for them. Ah, looks like gunnera, then. Plant in Autumn & by spring the roots will have gone deep enough to get moisture, even with a 2 foot drop in level. BTW did your g.manicata survive the frosts? If not, g.tinctoria is the answer. Survived (just) -7 in early May. I think the Priory looks bigger, actually even better than how I imagined it before. You’ve done a fantastic job there David, the grounds and the plantings look great and immaculate, something to be proud of as it’s your handiwork 🙂 Oh and fantastic blooms too, the scent of the honeysuckle must waft through the air for quite a distance! 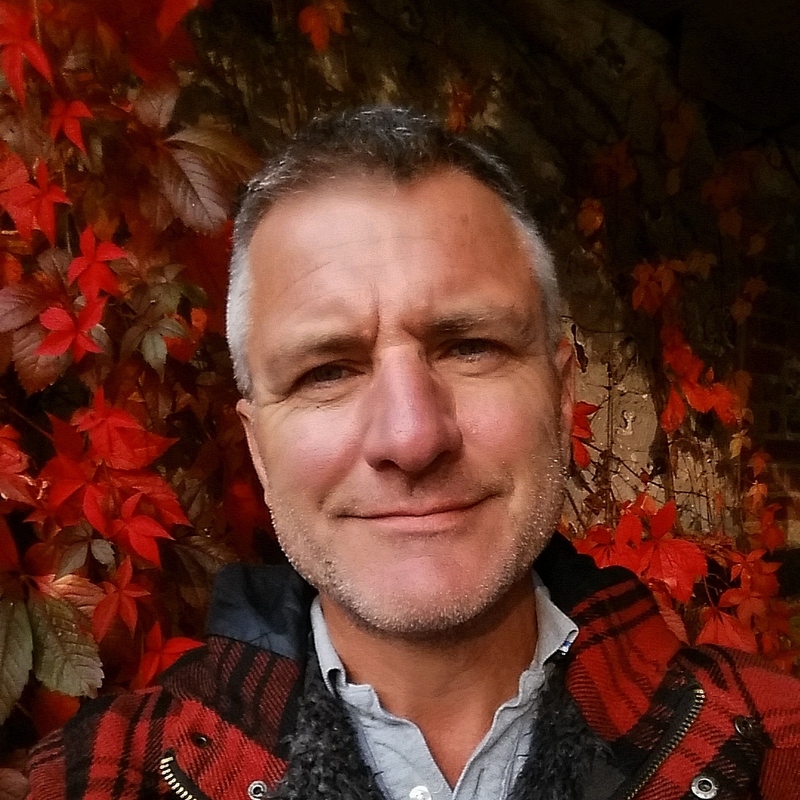 Dave, I haven’t often seen videos presented in a gardening blog post; yours furthers my understanding of where you are and what you do. I quite like that there’s no actual script…a bit of a ramble is enjoyable. The video gives a me a different idea, altogether, to the image I have from the photos, which, as you suggest, proffer a selective reality. But the two media compliment one another. 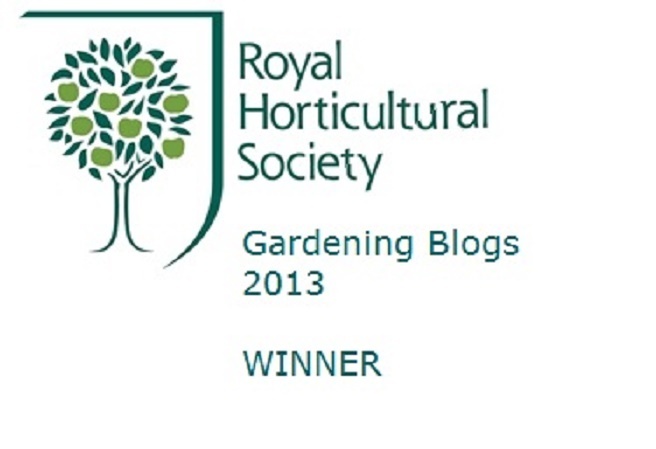 I’d like to see more gardeners use video. Well done. I loved the video. 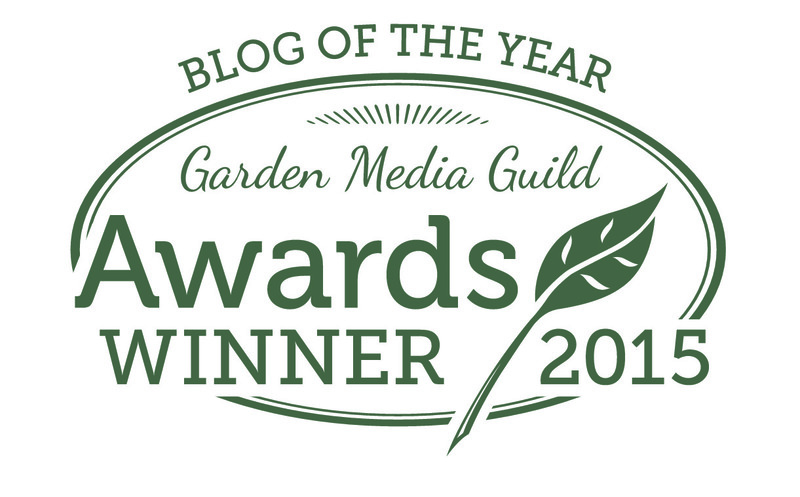 The photos were so good I felt I was there but the video really did add another dimension, I think it may have been hearing the birds, it did make me feel I was in the garden and I realised it was even bigger than I had imagined. Seems like I have changed your name…sorry Dave! Rave what a lucky man to have such a wonderful garden to work in. 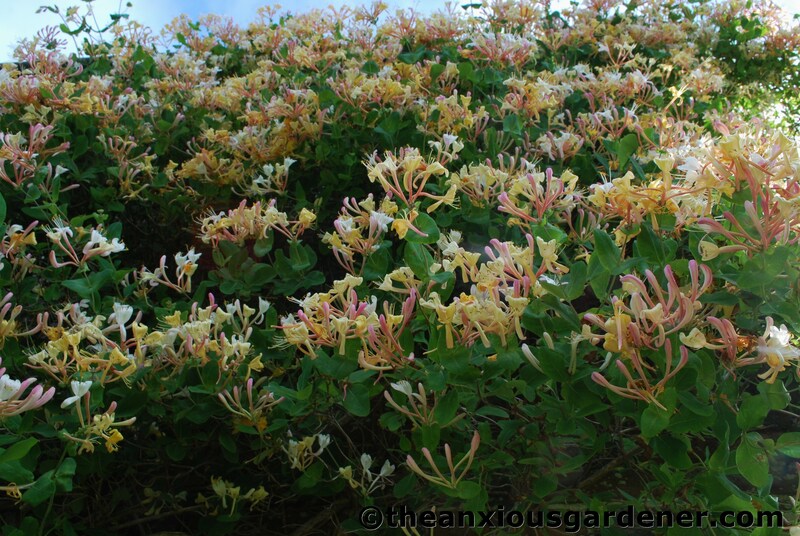 The honeysuckle is beautiful and I can’t see a single hole in your hostas. 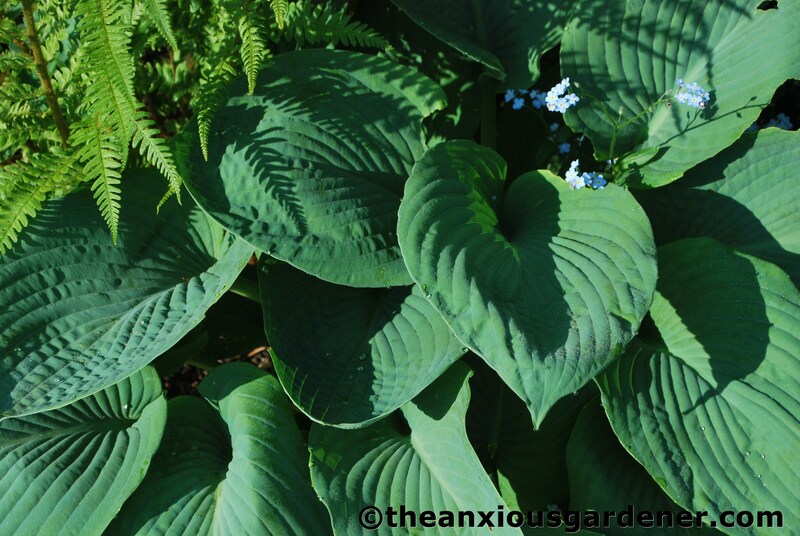 The garden is certainly moving into summer now and I will have to speak sharply to my garden and the snails that have already turned my hostas into doilies. 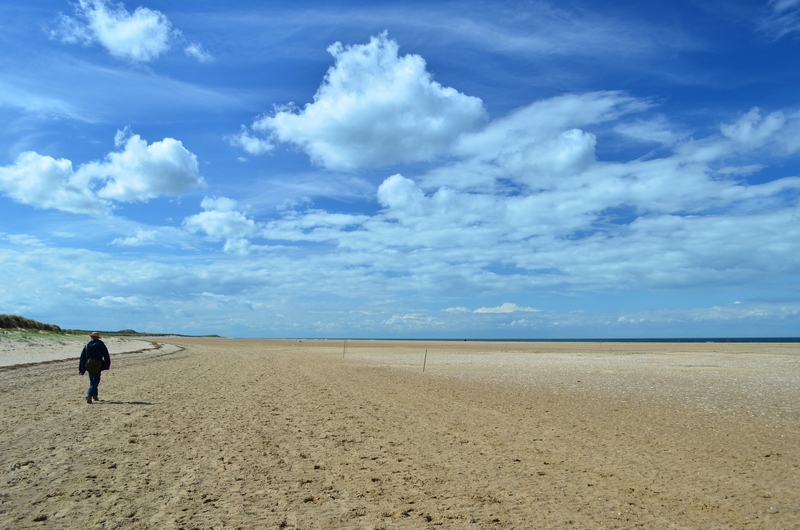 It certainly looks a vast expanse in which you have put in a lot of hard work and love.